Welcome to Tarps Plus blog. Get shopping tips on Poly Tarps, Canvas Tarps, Mesh Tarps, used for various purposes e.g. camping, patio coverings, and more. Choose a tarp company that has been in the tarp business for at least 10 to 12 years. Many things can go wrong in the fabricating process and it is essential to have a reputable company that has been making tarps for a long time. Many companies say they have been in business for years but that is simply not the case in many cases. When it comes to making the choice for this investment, spend an extra minute and see how long the company's website has been around. Companies like www.tarpsplus.com have been around since 1999; those are the kind of companies you want to make your custom tarps for you. Explain your application to the sales person so they know your exact use and needs. If your tarp has unique types of shapes, try to sketch out a diagram. If the price is lower than you thought be wary of custom short cuts. Many tarp dealers will charge less and cut corners on quality. Storms, hurricanes, floods and fires have increased significantly for the past 20 years. 2018 saw massive hurricanes, storms and fires. Having tarps on hand is essential for after the storm in the event of a roof getting torn off or covering property from ash due to massive fires in the area. Fire retardant tarps have been in high demand in 2018 and will see an increase for 2019. Colder and longer winters. Covering property in harsher and longer winters will be a trend that will continue and poly tarps are always the more economical way to cover things up in the outdoors. Innovation. Innovative ideas for products and uses requiring tarps has been a trend over the past 5 years and the trajectory looks like it will continue to increase. Tarps have many uses and applications and are used as a sub component for new inventions quite a bit. As times change so will tarps and the way people use them. 2019 looks like there might be more changing along the way. Canopy replacement tarps are needed to replace the old tarps on top of canopies and the heavy duty tarps are needed to last the elements. Heavy duty lief tarps are needed to drag and remove debris like leaves, wood and trash. Many new tarp owners use tarps for the wrong application and find themselves with a defective piece of material. The applications for poly tarps and canvas tarps range widely so here are the key points to remember for each type of tarp. Below are the key points for each type of tarp. The above are just a few application for canvas tarps and poly tarps but there are countless of uses. The tarp industry is constantly changing due to the countless of applications for the unique covers. In 2018 we can expect several particular changes. As climate change and more extreme weather occurs more types of custom insulated tarps will be in demand. Record low winter freezes have put various types of shapes and sizes of insulation coverage for many industries for piping, machinery, mechanics etc. Leading tarps supplier Tarps Plus owner Michael Stein stated, "We have had a high demand for custom tarps to satisfy more extreme weather related issues." In 2017 we saw a significant spike in hurricane tarps sales due to hurricanes in Texas, Florida and Puerto Rico. The specialized hurricane tarp covers were needed by over a million people due to the 2017 hurricane season. New start ups in the tarp industry will saturate the market. Make sure to get quality covers from long term established vendors. Covers like insulated tarps, hurricane tarps and custom tarps will be in high demand. Oil will start to slightly rise again and increase the cost of resin (an essential component of poly tarps) which will raise the cost of plastic based tarps. Below are tarps being used for roof covers after a hurricane. The light duty blue poly tarps are common covers for roofs after a hurricane. Hurricane tarps after the storm destroys a roof. After a hurricane people I left with flooding and compromised structures. It is essential to have the proper materials after the hurricane is done in its path. Make sure the tarp is 100% waterproof to prevent any further leakage. The poly tarp is used until a roofing company can repair of the compromised structure so in most cases only light duty tarps are necessary. Grommets with rope reinforcement around the perimeter of the tarp are important for securing the cover to the structure. The most popular sizes of tarp used for roofing contractors are 16' x 20', 20' x 20', 20' x 25' and 20' x 40'. Not all hurricane tarps are made equally so it's important to ask the thickness, Denier, ripe reinforcement, grommet spacing and UV coating. Hurricane tarp season is June 1st to November 1st and people that live in the hurricane zone know this all too well. 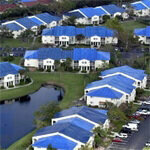 The most common hurricane tarps used our the economy grade blue polyethylene tarps. Roofers and Handyman will tack these tarps on to damage roof's after a hurricane to make sure that further water damage is not incurred. It's typical to see pictures of homes with blue tarps on top of them after a hurricane has stricken area. These tarps are usually light duty but sufficient enough to keep the home covered for a month or two until refers can repair the home. Typical size covers range between 14 x 20 to 30 x 30'. Grommets should be spaced every 3 feet minimum. Poly sand bags are important to make sure the perimeter of the tarp is waited down on the roof. 100 foot poly rope is also important to help tie the tarp cover to the structure. Having a small stockpile of tarps and various other supplies are important to have before the storm hits in order to be prepared when these items are in high demand. Please check with your hurricane awareness center for more details on preparedness. Baseball tarps and athletic field covers are used to cover the infield during times of rain, This enables the field to stay dry so playing time is more accessible. It is essential to make sure that there are heavy duty seatbelt grade handles every 10 feet around the perimeter of the tarp. Industrial grade triple stitching is important to make sure pressure pulling will not create tearing. The tarp cover should be heavy duty but light duty at the same time to enable transferring the tarp across the field easily. Any tarp over 100' x 100 and feet should be at least 6 to 7 ounces every square yard. When applying the athletic field cover to the field it is important to make sure several or more people are applying the tarp to prevent pressure from pulling on one side. 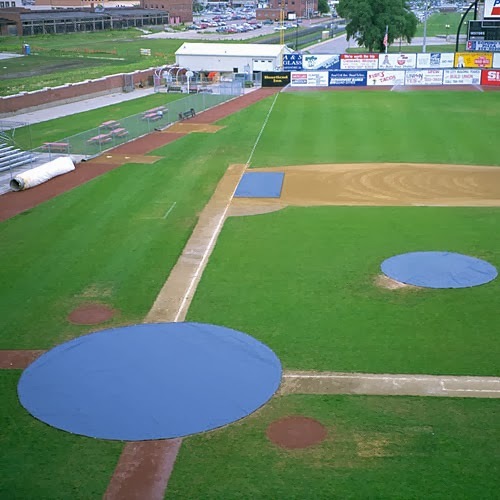 Here in the United States, baseball tarps and athletic field covers can be used all your round but the most popular months are January to May during the rainy seasons. Above is a picture of a heavy duty see Belgrade handle for a large baseball tarp. Double cross stitching with creases add layers to strengthen the handle. Our certified fire retardant tarps are licensed with the government's CPAI-84 specifications. 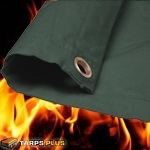 The Tarps Plus manufactured fire retardant tarps come in poly and canvas. Our fire retardant tarps are certified by the California State Fire Marshal. Our fire retardant tarps are all registered with the NFPA 701, CPAI-84 and California Title 19 Guidelines. The fire retardant testing process in order to become certified takes many steps. Tarps Plus fire retardant tarps have been certified for many years and have excelled with excellence. The tarp goes through a long testing process. 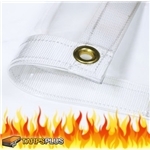 All our fire retardant tarps are cleared by the California State Fire Marshal's Office, which is a nationwide standard. 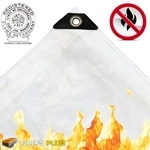 Our fire retardant tarps prevent the tarp from burning due to the special treatment. The Tarps Plus brand flame retardant polyethylene tarps or fire resistant tarps prove time and time again why we are the leader in tarps. All of our fire retardant poly tarps come with a California State Fire Marshal tag permanently attached to the side of the tarp. Never accept fire retardant poly tarps without this label. Canvas tarps do not have the label attached but can have a certification document provided. Sometimes the older methods are the best, people continually try to find alternatives for materials in the hope it will be cheaper and a more effective material, chances are it is a waste of time and money as once a material becomes popular and shows its effectiveness it can be incredibly difficult to ween customers off of it, after all, why should they stop using a certain product when they are not sure of its effectiveness, tarps have always been effective, and more people are using fire retardant tarps. The fire retardant tarps seem like a wise idea to some, and a silly idea to others. It should not be seen as a silly idea however, one plausible reason why you should opt for a fire retardant material instead of a regular one is because it is thicker; you can get it in many sizes to suit any need you may have. As you may be aware fire retardant tarps have many usages, and are used in a variety of trades such as builders, campers, gardeners, those who own boats, for general house hold duties and so on, all of which will want top quality. A tarp generally is used to protect people from the elements, more specifically rain. It is a tough material that can withstand the beating from a tough wind which makes it a perfect material for Lorries or any traders who work outside. It makes no sense why people would not opt for fire retardant material; you protect yourself from other elements so why not fire? Just because it has not happened yet, or is unlikely to happen does not mean it will not. Fire retardant material will always give maximum coverage and protection; hence it is always prudent and clever to use a fire retardant material to protect yourself and your property. It is always good to opt for a fire retardant tarp always, because, you could protect yourself from the rain with other tarps, but when there is a fire, you can protect yourself and prevent damage to your goods. 8.5 oz. Per Square Yard. These hay tarp covers are Super Heavy Duty. Our hay tarps are for serious farmers who need to cover hay bales. The hay tarps and hay bale covers are farmer's favorite because they know what craftsmanship a true hay tarp should be. So, if you are looking for what the professionals use at the best price, try our hay tarps. Our hay tarps can be used for a horse hay tarp or just regular heavy duty hay tarps. Each hay tarp is reinforced with a super tough poly fabric and a tough super strong tensile strength. Special treatment for long outdoor life. Rope is encased in the hem and a spur eyelet is set into a multi layer fold Special U.V. Treated silver reflects light. 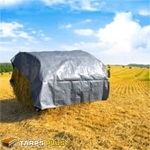 These hay tarps or farm tarps are great hay tarps for rain snow & wind. When it comes to covering horse hay with tarps, we suggest our hay tarps. The hay tarps are black on one side and silver on the other - Triple Reinforced Seams Heat Sealed - 1 Inch Ring straps in Nylon Webbing Every 2 Feet - Triangular Reinforced fabric - Super Heavy Duty 16 Mill. Farmers have a great need for very high quality tarps that they can use everyday as a part of their occupation. Choose hay tarps that represent only the highest quality and craftsmanship at a great price. A hay tarp such as this should be reinforced on both sides. Most are made from a tough poly fabric to be able to prove strong enough for any job and will last with extended use. Some varieties are also treated so that they are UV resistant. The hay tarps are also a great multi-use products that can be used for a lot of different things are great for extended use in the elements. Our hay tarps are made with very dense materials, featuring as least a 14 by 16 weave count and weighing over 8 ounces per square yard. Most varieties also have heavy duty grommets implemented around the edges at least every 18 to 24 inches, and these are designed in a very rust resistant steel so for long lasting quality. 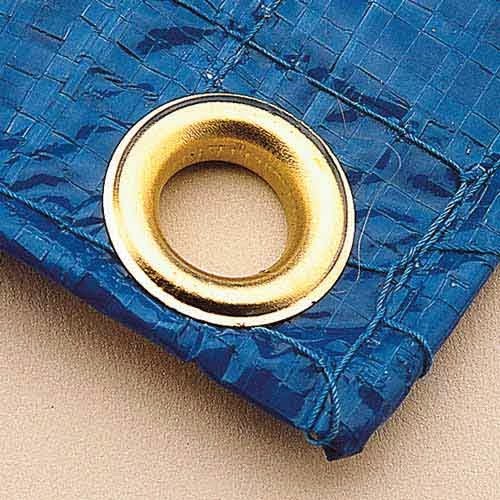 These grommets are implemented to allow the user to secure it easily as necessary. These tarps are treated several times so that they will last. They are tear resistant, mildew proof, water resistant or waterproof, and extremely flexible. The seams are sealed and heated so that they will stay hemmed and resist tearing. They are available in a number of various sizes, so that a farmer will have a lot of options to suit his needs. These vary in size from the 14 by 48 to the 45 by 48 foot. Most of them are black in color. This is the most popular color for hay tarps. The waterproof canvas are used for covering and various other purposes. You should use the canvas tarpaulin to safeguard the loaded truck bed, for stock trailers, being a backyard canopy, like a covering addition, in addition to a various other patio, outdoor, backyard surroundings. Canvas tarps are made to become water resistant similar to different covers along with are also made of ultraviolet ray resistant fabrics. 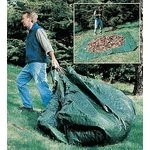 The UVI cared for tarps are just the thing for any kind outdoor adventure. These kinds of tarps will come in several colors, sizes and patterns. Tarps that are produced from canvas are one of the most useful shelters nowadays. They may be strong enough to help resist nearly all weather conditions, plus they are also available in flame retardant stuff as well. So you will simply safe and has no campfire accidents to go with this canvas tarpaulin. These good quality tarps is likewise supplied in lots of different program sizes to suit your ample desires. Canvas water-resistant coverings are made to the biggest riders. All of the fire proof canvas tarpaulins are certified before they come to you. 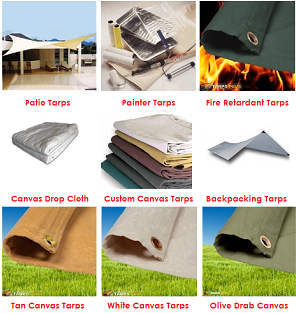 You will be guaranteed that will just about any canvas tarps you shop from Tarps Plus is usually well checked as well as approved. The actual flare retardant raw wood tarps are produced for the transport regarding lumber and they are also come in different weight load, coloring, as well as sizes. Canvas covers tend to be just the thing made for securing both, the inside as well as external. If you use one of these tarpaulins to protect a thing that you'll be lifting at the back of your own pick-up truck, you will not have to worry about the weight as the Canvas materials are pretty heavy and can relax and go without lots of complex safeguarding. These types of shelters suit above virtually any curled surface and therefore are additionally a lesser amount of evasive in comparison with some other throw away plastic material tarps. This will ensure the less chance of particular injury. If you are a camper, and interested in camping and hiking, you should know that the Canvas is the best material for producing Camping tarps and Tents. Commonly people use tarpaulins made from canvas for covering vintage cars where exceptional attention needs to be taken for delicate paintwork surfaces. This canvas material can also be utilized as drop cloths while painters decorate a home as a special care needs to be taken in order that fresh paint won't blemish carpets and rugs or even wooden floors. Canvas tarpaulins will also be usually inured to cover motorboats as they can be purchased in glowing blue canvas which is a mostly used color for covering boats. As the most canvas tarpaulins have made from natural fiber like cotton, it will be very environment friendly option to choose for. The environment is not harmed by these types of tarpaulin as it more durable and comes in degrade and rot. Also it mixes very well with its natural ambiances as canvas is usually finds in tan or sand in color. Canvas covering are well suited for addressing up a service that you should take in for breathe that unlike discounted tarps canvas tarpaulins usually do not result in condensation. So why do you require a camping tarps? In the event that the ground is wet and sloppy, you can set up your portable shelter on top of a covering as an additional ground sheet (simply verify all the canvas is inserted under the tent). When you come to bring your tent down, the base of your tent ought to be pleasant and dry. Some place to cook, eat, and protect under the cloudburst. Recollect that you ought to cooking outside, not in your tent. A canvas gives you a chance to eat actually when wet! 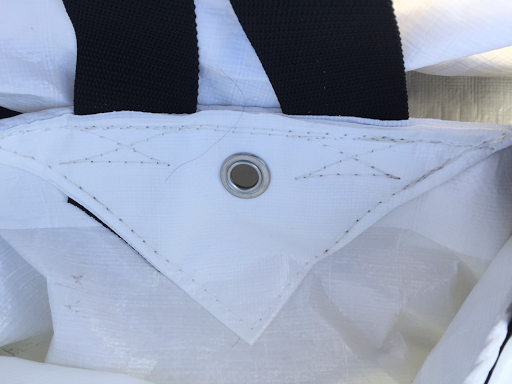 An off the cuff cover when backing the rainstorm, empowering you to get your ropes into your tent yet stay pleasant and dry. Appreciate a pit fire when it’s wet. Use canvases and shelters to trap a greater amount of the warmth. Your children will be happy to play within this Camping tarp. If you are in a search of this type of tarps, Head over to TarpsPlus.com and find most durable and affordable tarps for your need. The following Tarps have huge demand in Winter. If you are searching for information about baseball mound tarps then there are different kinds to choose from. There are both large and small ones and they can be used on the field in different areas. Some cover the whole field while others only cover the mounds and bases. At different times rain and inclement weather can delay your sporting activities. When that happens you will want to cover your field up so it does not become muddy and slippery and the game can resume as soon as possible. An athletic field should be kept in good shape since people are playing on it. There are many high quality covers and tarps that can be used to keep it protected. A protective tarp can quickly and easily be used to cover the field. Several people working together can spread it out over an entire field in a very short amount of time. Both minor and major league baseball teams use them on their fields during a rain delay or when there is excessive heat from the sun. The materials are usually UV resistant and made from high strength fibers. The covers are designed to be easy and simple put down and to take up off of the field. A white colored tarp will also reflect heat away from a playing field. The polyethylene variety will not mold and rot like other varieties sometimes do. Many of the covers are also light weight and can be moved and carried with ease from storage to the mounds. If you manage a team or own a facility baseball mound tarps should be an important part of the upkeep of the playing fields. For more information you can go online and find different varieties available. You will also be able to see the different sizes and prices. There are quite a number of uses for a heavy duty tarp. Many people like to use for creating poly tarp and canvas tarps as well as other shelters. They may use them to do this since they are quite hardy and do not get torn easily. It is always advisable to try and use a tarpaulin that is of the highest quality. The main reason for this is that it may last for a very long time and many people can attest to this fact. The strong tents are also more costly and many people feel like the prices are actually justified. It is easy to identify the strong tents or materials since they are easily discernible from the light ones. By simply touching the materials, one can tell which one is harder and may last for longer that the other. The lighter ones are not hard to the touch and most people can tell the difference by simply looking at them. A heavy duty poly tarp may be used in times of summer. 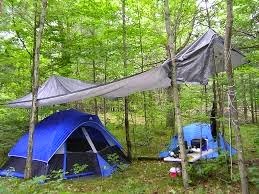 Most people use them in the form of tents which they use to go for camping trips. They use them to sleep inside and this keeps away insects and other things that would otherwise make life miserable for the camper. Majority of the people use the hard materials since they last for much longer than the ones made from much lighter materials. The main reason that people use tarps is that they are easy to construct and lug around. The heavy duty tarps are easily transported and when one is finished wit it, all that they have to do is to fold it away. A heavy duty tarp is one of the most famous and common pieces of equipment that any one who loves the great outdoors is familiar with. They can be acquired from various shops and stores that sell items that are used by campers. Large tarps over 100 x 100 should be heavy-duty with at least a 14 x 14 mesh count. Different material such as polyethylene will weigh less, even though heavy-duty compared to canvas tarps. Heavy-duty poly tarps are waterproof inherently. Canvas tarps need to be treated, but do not resist all do as well. The main factors to consider with heavy duty tarps are mesh count, rope reinforcement, mil count and poly coating or thread count. Are your tarps good with wind? Yes, very much so, but we cannot guarantee against any type of weather related incidents. If you are in a windy area and you wish to tie your tarps to something, we recommend bungee cords with hooks which can be seen on our Accessories page.